It's probably a bit late for another gift guide but for all you last minute shoppers out there here are my gift guide suggestions for any book lovers. 1. Book Lovers Calendar - This is available from Waterstones and is the perfect calendar for any avid readers. 2. Books I Have Read & Books I Want to Read - This is also from Waterstones and is great for writing down observations on books you have read and making notes on any book titles that have caught your eye to remember later. 4. A New Book Trilogy or Series - Buy them a new book box set or trilogy to sink their teeth into. New books is always a good go to gift. the Works have some fantastic book box sets available. From Hunger Games to Game of Thrones there's a bit of something for everyone. 5. Fantastic Beasts and Where to Find Them Screenplay - The newest offering from JK Rowling any Harry Potter fan will love this (if they don't already have it) and the cover is just stunning. 6. Book Themed Mugs - Not to be generic but if you're a book lover there's generally a cup of tea to go with reading (or coffee or whatever your poison may be.) 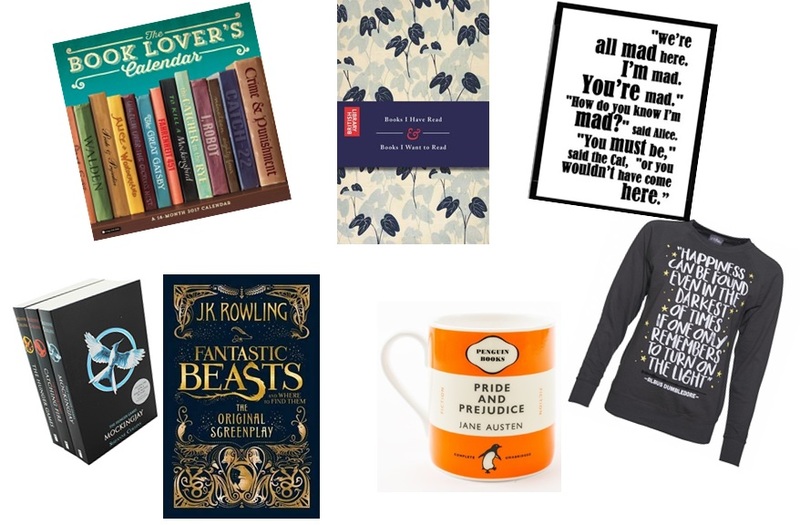 Why not give the gift of mug based on a favourite book. The Penguin themed ones available at Waterstones are such a cute idea. 7. Book Themed Clothing - A shirt, jumper or pyjamas of any sort that resembles a fiction series is always a good idea. Truffle Shuffle have some fantastic clothing and gifts relating to books. Pictured a Harry Potter quote jumper. Or Primark have some fantastic themed clothes and pyjamas. So there's my gift guide for book lovers. Hope it helps out all you last minute shoppers! Or if you've finished shopping why not treat yourself? Please note I have not been asked to promote any of these stores or products this is all just my personal opinion and any images belong to the rightful owner.